Time & Billing Associates is now a Centerbase Certified Partner! 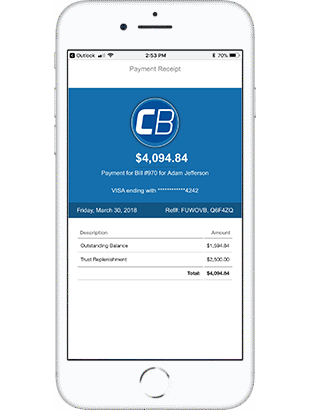 Access From Anywhere: Centerbase is a cloud-based software that includes a native iOS and Android Apps. Complete Billing and Case Management Data Migration: Import and link current and historical billing information as well as contacts, cases and related records directly into Centerbase. Unlimited Database Size: Since Centerbase is cloud-based, there is no limit to the number of records stored and database size does not slow down response time. Enter time from your mobile device while you're on the go. With instant syncing between your mobile device and computer, means you can start a timer from your phone and stop it when you return to your desk. 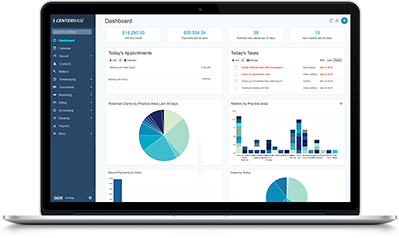 Centerbase includes complete general ledger accounting which fully integrates with our timekeeping and billing system. This means you now have a single, up to date view of your entire firm's operations at all times. Track all the important information, contacts, documents, emails and calendar actives related to a matter in one place. Create separate matter layouts for different practice areas and utilize matter dashboards to know the status of your matter at a glance. Capture your institutional knowledge and best practices with workflows that are configurable to your firm's practices. Dramatically reduce time and effort for client intake, conflict checks, bill preparation and collections, document generation and more. Contact Time & Billing Associates to learn how Centerbase can help provide your attorneys more accessibility to their client data and documents as well as improve your overall law firm efficiencies.